Cocaine is a drug extracted from the leaves of the coca plant. The coca plant is a shrub from South America which measures 1.5 to 4 meters high. It comes in form of a white powder and it’s also called: Aunt, Baseball, Batman, Bernice, Bernie, Blow, C-Game, C-Dust, Coke, Powder, Line, Rail, Snow, Yeyo. 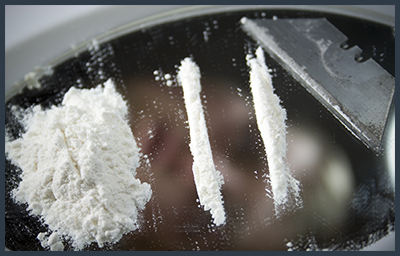 Many other street names and nicknames for cocaine are used, but those are the most common ones. Cocaine stimulates the central nervous system so powerfully. This drug is highly addictive because the need to increase doses to experience the initial effect is felt quickly. The effect created by cocaine fleets because it usually lasts only a few minutes, depending to the form in which it is taken (snorted, smoked or injected). As with all drugs, each person responds differently to cocaine depending of the tempering, the physical constitution of the person and the amount of doses consumed. It generally brings an indifference to pain, fatigue and hunger. When first taking cocaine, there is euphoria and mental excitement. Afterwards, when the product begins to fade, fatigue, feelings of depression and anxiety sometimes appear. They do not want to feel tired, depressed or anxious, and for this reason keep taking it. They want to feel the euphoria, the excitement, so they rush to regain this state. However, the effect from the first use will never reoccur in the same manner and with the same intensity. It’s a little something that happens with most drugs, but specifically with cocaine. Long-term use leads to nervous system disorders or panic, a feeling of persecution, violence, attacks of paranoia and hallucinations. It is also possible that there is a phenomenon of disconnection between the psychic and the physical, as if the person becomes completely frozen by the drug while their mind continues to function very quickly. It could be something as simple as wanting to take something on the table, but physically not being capable of getting up from their chair in order to do so. Note also that a person under the influence of cocaine can drink plenty without feeling the effects of alcohol. We can also see that people using cocaine are frequently alcoholics as well. These are two drugs that are regularly taken at the same time due to the effect mentioned above. The person is now facing two drugs, a stimulant and a depressant.